The Young and Hungry Arts Trust Ambassadors are a group of keen bean Year 12 & 13 students, who attend shows at Circa and others theatres throughout the year and write reviews. They joined us at The Ugly One on Tuesday night. Here is a review from Eva Poland. Reviewed by Eva Poland, Chilton St James School. Simultaneously one of the most bizarre and one of the most brilliant things I’ve ever seen, Circa’s production of The Ugly One is deeply haunting from its slow start to sudden dramatic finish. 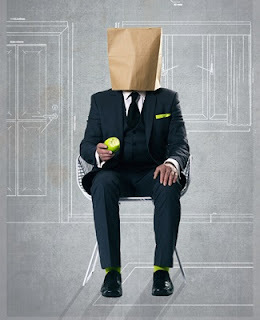 The play tells the story of Lette, a plug-inventor at a large corporation who is denied the right to present his product at a convention after being told that he is incredibly ugly. When this is confirmed by his wife and friends, Lette eventually becomes so disturbed that he opts to have a total face re-shaping from a plastic surgeon. This causes a radical change in Lette’s life; suddenly he is loved by everyone and paid a much higher amount of money than he was before. Throughout the production four actors are used to play seven key characters, with the actors never leaving stage and no transitions between scenes. This can be rather confusing at first but not to the detriment of the storyline, the actors handle the task smoothly and all of them are equally accomplished in playing their roles. By far one of the most effective aspects of the show was the script, which is sharp, honest and almost unbearably clever. Thankfully the director has been kind enough to not overcrowd it with complicated action or scene changes, and the humour of the writing shines through. If anything, the unusual structure of the play adds to the effect of isolating the audience and making them question the morals of our society and whether or not the amount of importance we place upon beauty can be justified. The set was another factor that contributed to the frank, unfiltered genius of The Ugly Ones. A stark, simple, grey and familiar looking “office”-type setup was plausible when it doubled as a house, an hotel, a convention stage and even a rooftop. Lighting and sound were minimal, drawing the focus toward the acting and storyline. The Ugly One is on at Circa until 8 August.